Dropwizard is an open source Java framework used for the fast development of RESTful web services. Or better, it's a light-weight best-in-class set of tools and frameworks for building RESTful web services. "Its goal is to provide performant, reliable implementations of everything a production-ready web application needs. Because this functionality is extracted into a reusable library, your application remains lean and focused, reducing both time-to-market and maintenance burdens." Dropwizard allows a developer to build an initial project very fast - a so-called quick bootstrap project. This helps the application to be packaged in a way that allows it to be easily installed on the production environment as a stand-alone service. If you've ever been in a situation to develop a REST service in Spring for example, you probably know how hard it can be to set up a skeleton service (We will compare Dropwizard and Spring Boot approaches later on). 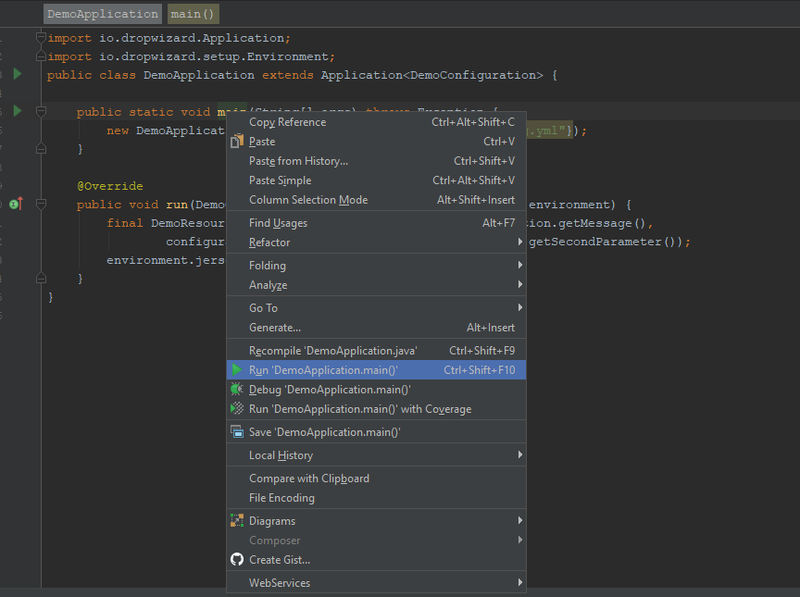 With Dropwizard, it is a matter of literally adding one of the Maven dependency configurations. Although, Dropwizard is not everyone's cup of tea, some people don't like using the components and libraries it provides, and that's perfectly fine. Jetty HTTP library: As we know, we need an HTTP server to start the Web application. Dropwizard uses the Jetty HTTP library to inject a tuned HTTP server directly into your project. Instead of deploying your applications to an application server or web server, Dropwizard defines a main method that invokes the Jetty server as a standalone process. Dropwizard recommends the use of Jetty server to run applications, other servers such as Tomcat are not officially supported. Jersey: is one of the best REST API implementations on the market. This allows you to create clean classes which map HTTP request to simple java objects. Also, it follows standard JAX-RSX specification, and Dropwizard uses it as the default tool for developing RESTful web applications. Jackson: has certainly become a standard when it comes to data mapping objects to and from JSON. It is one of the best object mapping APIs for JSON format. Metrics: Dropwizard has its own library, that allows us to read the application metrics through HTTP endpoints. Guava: is Google's utility library that gives us a large number of classes to speed up development in Java. Freemarker and Mustache: Choosing a template processor is one of the more important decisions. Dropwizard uses well-known and popular and processors to create user interfaces. Apache HttpClient: Provides the ability to interact with other web services. Hibernate Validator: Used for validating user input. Jdbi: Database access classes which have Hibernate support. Joda time: Library for handling dates and time. Liquidbase: Open source database-independent library for tracking, managing and applying database schema changes. These are sort of the very core ingredients if you want to make a nice RESTful JSON serving Java service. Dropwizard combines it very nicely from an operations perspective. The Metrics piece is really important because not only does it provide metrics but it also alerts you if you're not implementing best operational practices, such as creating health checks. Health checks are registered as part of application creation. Iif you don't register a health check, the startup will warn you and complain every single time you start up. I'll include this in an example later on. Dropwizard officially supports Maven. You can use other build tools as well, although most of the guides and documentation use Maven. Maven is a project management tool, based on the concept of project object model (POM). Upon successfully configuring Maven, we can start making our Dropwizard application. Each Dropwizard application stores the configuration in YAML files. We must create the "config.yml" file in the root directory of our application. This "yml" file will be deserialized to an instance of the Configuration class of our application. The configuration class of our application is a subclass of the Dropwizard configuration class (io.dropwizard.Configuration). message: Hi %s!, now you will learn about %s from Stack Abuse! The DemoConfiguration class will be deserialized from the YML file and the field values will be filled in as they are configured in it. The main application class should now be created. This class will pick up all the necessary modules and prepare our service for use. "content": "Hi Friend! Now you will learn about Dropwizard from Stack Abuse!" This is a simple POJO model. Our class uses the Java Bean standard for the content property. This allows Jackson to serialize it to the JSON we need. The Jackson object mapping code will populate the content field of the JSON object with the return value of getContent(). Resources are the essence of Dropwizard. The resources are actually the definitions of the endpoint URI of our service that can be accessed via the HTTP protocol. In this example, we will create a resource class with a pair of annotations for mapping HTTP requests. @Timed is used for automatically recording the duration and rate of its invocations as a Metrics Timer. It is now necessary to register the class above in the main class of the application. As mentioned above, the application class serves to initialize our service and all necessary modules, so all resources need to be registered here to be initialized with the service. It is a good idea to create a so-called FAT JAR that will contain all the necessary ".class" files needed to run the application. This JAR can be deployed to the different environment from testing to production without any changes. Now, your Dropwizard application is listening on port 8080 for application requests and port 8081 for administration requests. You will notice that we used the arguments server and config.yml to run the service, telling the server what configuration file to use. This can also be done in the main method of DemoApplication class, like in the example above. You can access your application at http://localhost:8080/v1/resource or with parameters http://localhost:8080/v1/resource?first=John&second=everything. You should receive a message with or without forwarded parameters, depending on your call. Health Checks are simply just HTTP endpoints that iterate over various hooks that you create. While some give in to the temptation to return a Health Check that always returns a "healthy" status, as long as the service is running, this is really bad practice. Health Checks should be used to improve code, for an example: If you have a database, you must be able to provide a connection to the database. Put a health check there, make sure that the database doesn't have too many client connections, or any thread dead locks, etc. Like before, we now register our HealthCheck class in the main class of the application. Now, when you start your application your console log output won't complain to you about the health checks. Both are really easy to learn and get started within hours of writing your first application. With our application up and running, we can give some key notes of using Dropwizard for developing RESTful web services. Dropwizard is production-focused, easy to use, simple to deploy, simple to monitor, develop and set-up a high-performance REST framework. Maybe one of the biggest advantages is that offers an incredibly fast bootstrap setup for your project. With an included set of tools and libraries to satisfy the need for most developers, you don't have to worry about adding and configuring each of them separately. Some disadvantages would be that you are kind of restricted to using what Dropwizard offers or supports (losing freedom), but also by adding too many third-party libraries can cause unnecessary complexity in the development.